Function Space for dinners, showers, weddings. Built in 1853, Taylor House Bed and Breakfast of Boston, Massachusetts resides in Boston's Jamaica Plain (JP) section amongst some of the best works in suburban architecture. 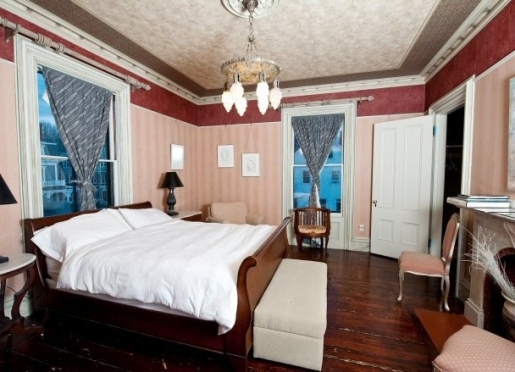 Located inside of the Monument Square Historic District, the bed and breakfast is very close to great shopping, fantastic restaurants, and Jamaica Pond. The Sam Adams Brewery and the Arnold Arboretum are both within walking distance of Taylor House's front door. The beautiful Jamaica Pond and "JP's" town center are less than one block away. Public transportation makes it easy for guests to see as much history and as many museums as they wish throughout Boston and Cambridge. The Museum of Fine Arts and the Boston Symphony are two absolute must-sees and easily accessible by public transportation. 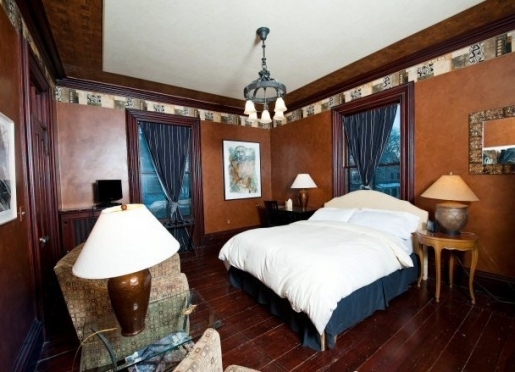 This Victorian home consists of spacious guestrooms with private baths, wifi, cable HDTV and ashort-term apartment. The guestrooms are named after the former owners of the house. The gardens surrounding the home are inspired by its Victorian style and include walking paths, fountains, and gathering places full of bold and colorful details. Each morning, a continental plus breakfast is served in the first floor kitchen with fresh baked bread and pastries as well as fresh cut fruit and cereals and a casserole of the day. 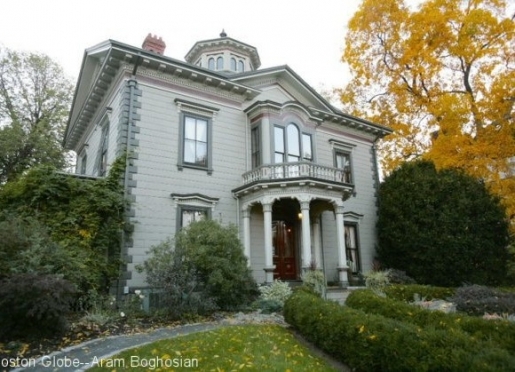 Taylor House, a gracious Victorian home in Boston’s Jamaica Plain section, was built in 1853 as a summer house for George W. Taylor, an international merchant head-quartered in Boston. It is situated within the Monument Square Historic District, and lies in an area known as "Pondside", which contains some of Jamaica Plain’s finest suburban architecture. 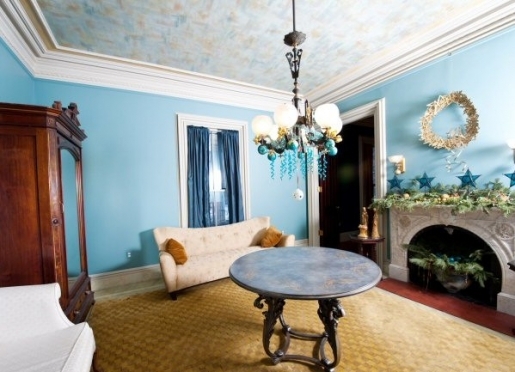 The structure is predominantly Italianate in style. A distinctive octagonal cupola sits atop the main house. The house is surrounded by Victorian-inspired gardens and lies less than one block from a beautiful pond and a town center with excellent dining and shopping. We are close to public transportation so that a car is not needed when visiting. Boston is a great walkable city. A multi-stage restoration project was launched in 1996 and is now complete. We now have a function space for dinners up to 30 and party/receptions up to 50. Three spacious guest rooms with new private baths are available: the Taylor, Beaumont, and Haffenreffer rooms, named after former owners of the house. Upon entering the main lobby through double arched doors, you will see a beautiful staircase leading to the second floor rooms. A continental plus breakfast that includes fresh baked bread and pastries as well as fresh cut fruit and cereals is served daily in the first floor parlor. We offer a congenial, tasteful and serene environment that will enhance your visit to Boston, whether you are here for business or leisure. Travelers are always looking for memorable and relaxing experiences. Let’s discover more through the words of our innkeepers. Many thanks to Dave Elliott for sharing his own secrets with BBOnline.com! We get most of our visitors because they have family in the neighborhood. About 60% of our business is from grandparents that come to stay with us to visit their families. We also get tourists from around the world and parents of students of the many nearby universities. We are best known for our wonderful breakfast, guests love it! We also do functions, dinners, weddings and showers. People come to Boston to experience the historical aspects it has to offer. It is very easy to get around in the car for sightseeing. There is so much to see, and many people regret when they only give themselves 2 or 3 days here. 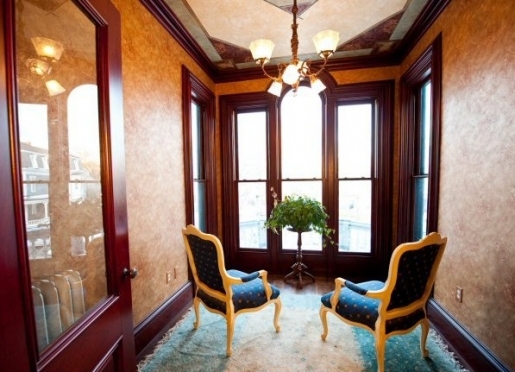 This compliment comes from one of our guests: "I've been coming to the Taylor House for 9 years. It's my preferred place to lodge when I'm in Boston--I would consider it Boston's hidden gem. From Dave's hospitality to Daryl's great cooking, the sweetest dogs in Massachusetts, the short walk to Jamaica Pond, the even shorter walk to Boston's bountiful good eateries, it is the place to be." This comes from someone who has been a guest since 1997: "It feels like we are coming home each time we visit our grand-kids." Boston has 300 acres of green space for guests to enjoy at the Arnold Arboretum. We have beautiful jogging and bike trails available near Jamaica Pond. Many people that haven't visited the area assume it's mostly urban. If travelers are planning to stay a few days or more, we suggest they visit the Museum of Fine Arts and the Boston Symphony. They should also take public transportation anywhere in Boston/Cambridge to see as much history and as many museums as they want. 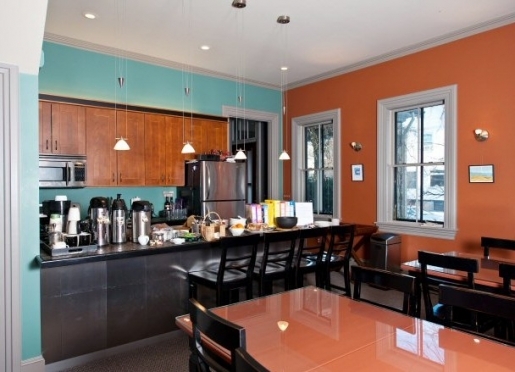 We are very close to many excellent restaurants, shopping, and Jamaica Pond. Within walking distance is the Sam Adams Brewery and the Arnold Arboretum. Among our favorite restaurants are Ten Tables, Tres Gatos, JP Seafood (Japanese), Bukhara, ViVi, and the good old fashioned Galway pub with full bar and big portions. We usually refer people to our web site and we have a What-to-do page. 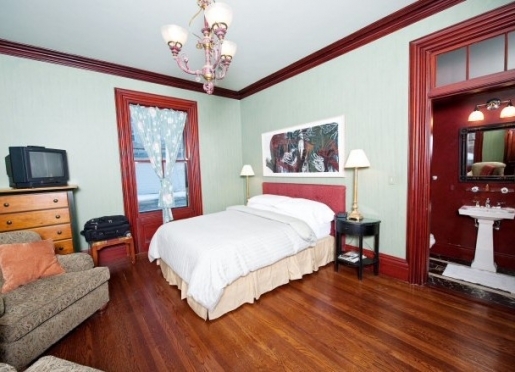 We have a 3 rooms and an apartment for short-term rental. All have private baths. We accept well-behaved dogs only in certain guest rooms. Too many people are allergic to cats. "I've been coming to the Taylor House for. 9 years. It's my preferred place to lodge when I'm in Boston. From Dave's hospitality to Daryl's great cooking, the sweetest dogs in Massachusetts, the short walk to Jamaica Pond, the even shorter walk to Boston's bountiful good eateries .... The local eclectic shops... All within Jamaica Plains friendly community of Bostonians. Taylor House sits in the middle of it all. It's a great place to stay. Simple amenities but more Boston than the hotel fare will ever offer. The rooms are unique and clean. The beds could be more comfortable but never miss breakfast. You'll enjoy the peace and quit and the beautiful back patio and the special BIG home called Taylor House." "A lovely B&B, most courteous and helpful hosts, excellent breakfast, ideally situated, easy to find, in a lively neighborhood (nice restaurants and shops). Highly recommended. We really enjoyed our stay." "Perched between Centre Street (the hub of Jamaica Plain) & the Olmstead park & pond, the Taylor House was a perfect location for our visit to friends. Our room was spacious & clean, though the shower was relatively small. Owners were present at breakfast but not obsequious, as some B&B owners can be. They were also gracious when we had to cancel a trip due to a death in the family, and were available when we needed to reschedule. Also, when we asked about a late checkout, they let us have the room as long as we needed, since no other guests were staying in our room that evening. The little outside area was a nice retreat. Best of all were the 2 dogs, which made us feel at home." 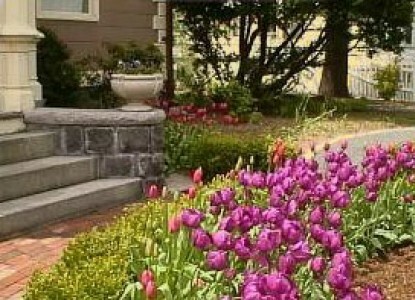 Our landscaping project began in 1997 when the firm of George Carty developed a schematic for our property. The design flows from the architecture of the house with its bold proportions and decorative detail. We asked Mr. Carty to create an environment that blends function and beauty, using plantings, paths, fountains, and gathering places. The following is his statement about the project. "The Gardens at Taylor House are modern interpretations of Victorian planting styles. An abundance of flowering plant species is set within distinct garden areas in ways that allude to bygone days. The grounds contain five separate gardens that are woven together by meandering paths of granite cobble, brick, and gravel. The garden fronting the house reflects its symmetry and plays with its unique architectural forms and plan. This garden provides a ‘stage set’ for the house with a large annual display bed edged in Boxwood and an abundance of heavily scented, old fashioned species: Silk Tree, Hydrangeas, Rose-of-Sharon, Trifoliate Orange, Spice Bush, and Mock Orange. The side gardens are devoted to a rich display of shrubs and perennials set in large borders. On the south side of the house the garden is large, billowy, and sun-filled, with roses and giant perennials that bloom from Spring through Fall. Wisteria and a multitude of other vines drape the porches and arbors. On the North side a moon garden with white flowers, many heavily scented and night blooming, offers shady retreat in the day and romance at night Two distinct patio areas provide secluded places for thought and conversation. The larger of the two is contained within an herb garden and has tables under a long colonnade for pleasant morning dining of bed and breakfast guests. The smaller patio is part of the entrance sequence to the house, an evergreen oasis in the shade of an ancient Linden Tree." Even though our gardens are still taking shape, we hope our guests will linger on Taylor House grounds to enjoy the softly woven colors, sweet fragrances, and tranquil areas of refreshment that we are creating. During the summer of 1999 we installed a brick courtyard and planting beds for herbs. We have also planted many perennials and shrubs throughout the yard. 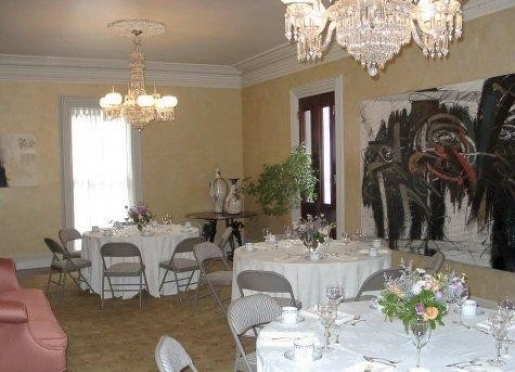 The first floor of Taylor House offers a unique, beautiful and intimate setting for private functions that range from cocktail receptions, showers and dinners to concerts and business meetings. Our interior combines antique and modern elements in a way that enhances the beauty of each, and our grounds feature lush garden spaces for entertaining when weather permits. For business meetings we can accommodate up to 20 participants. For all other functions the limit is around 35. At social events we do not allow children under the age of 9. Afternoon events may run until 5 PM with clean-up completed by 6 PM, and evening events until 8:30 PM with clean-up over by 9:30 PM. We offer a variety of services that can help make planning easier and lead to a successful event. Examples of these include arranging for entertainment by classical or jazz musicians, menu planning, color themes, and flowers. In addition, we have a stock of function items for rent at below market prices and with no delivery fee, representing a savings for you.v Contracts are required for all events as well as a $200 refundable security deposit to cover any damage or spills that necessitate replacement or professional cleaning. A detailed information booklet all about functions at Taylor House is available by e-mail or during your site-visit of the space.